Our evening arrival from Jeddah, Saudi Arabia was rather uneventful. Which is pretty great, considering that our group of six consisted of two adults, two children, and two seniors (Kacey's parents). We were met at the airport by our tour guide from Memphis Tours who took us to the hotel. 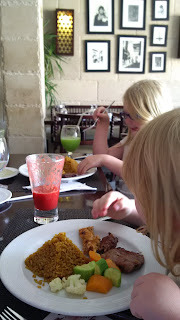 After check in, we had to wait a few minutes before the dining room opened for dinner, then we turned in early. We needed to be rested and ready to see over a thousand years worth of Cairo history in one day. 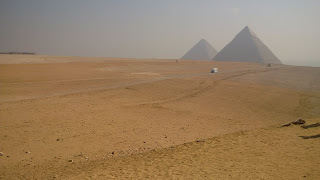 The next morning, we went to the great pyramids of Giza. They really are spectacular, and yet, even though there are signs everywhere not to climb on them, there were dozens of selfie-taking tourists doing just that. From the base of the pyramids, our tour bus took us over to a scenic overlook where we rode camels back to the pyramids. 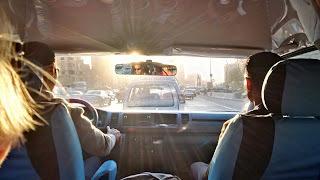 While Kacey and I took this same ride on our previous trip to Cairo before the kids were born, Kacey's parents cited the camel ride in Wadi Rum, Jordan as the reason they were going to stay with the van. The kids really enjoy riding large animals, and you have to admit that this is some pretty iconic scenery. After the camel ride, we visited the Sphinx. 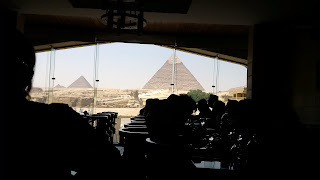 Our tour guide informed us that there had been a recent crack-down on unethical "camel photo" people who would claim that the cost to sit atop a camel with the Sphinx and pyramids in the background was "only 5 Pounds." One would naturally assume this meant 5 Egyptian Pounds, or roughly 50 cents American. 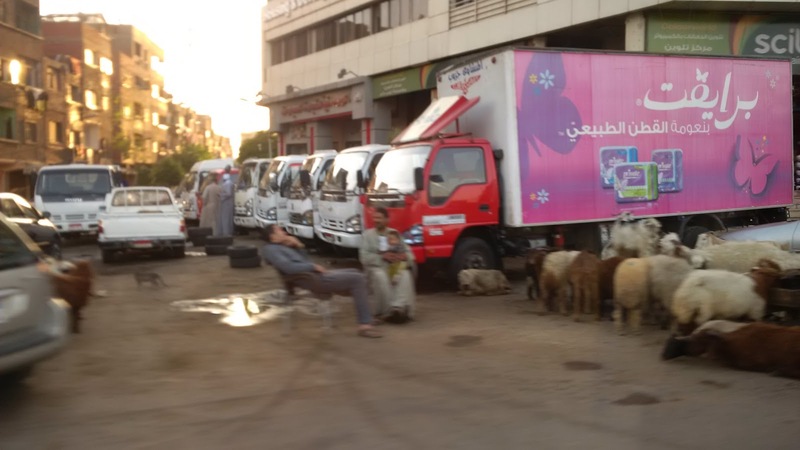 But once the riders were up on top of the camel, they were effectively held hostage when the photographer clarified "5 British Pounds"which is about $7.00 at the present time. The first stop was a papyrus store, which was probably in business with the tour guide operator as a mandatory stop in exchange for advertising, etc. Even if it was somewhat of a tourist trap, we got to see how the papyrus plant was processed into the famous parchment. There were also various myths captured in artwork on the wall, such as: Ultimate Judgement, the 14 gods, the feather heart, the Crocodilion, and the key of life. Fun fact: The direction that the people are facing determines the direction you read the hieroglyphics in. 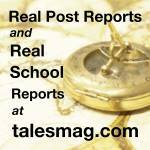 More on this later in the week. We had lunch at Abou Shakra, which is an Egyptian slow-eat establishment with an amazing view of the pyramids. 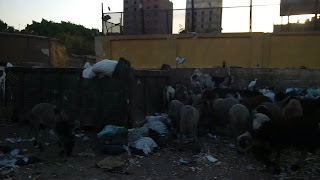 Our guide, Sherif [Share-eef] told them to hurry with our order, because apparently the standard Egyptian lunch is much more relaxed and casual with regards to time. 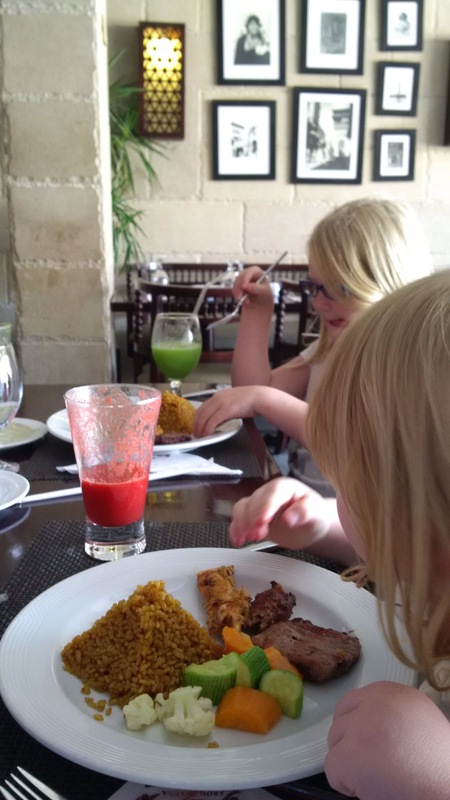 Our kids got really liked the pyramids of rice that came with their meals. After lunch, we went over to one of the oldest Egyptian churches in the Old Cairo (Al-Fustat) area, the Hanging Church. It's a Coptic church that dates back to the 3rd Century. It's called the Hanging Church, or "Al-Muallaka" (the hanging) because it was built on the ruins of two old towers that remained from an old fortress called the Fortress of Babylon. It was dedicated to The Virgin Mary and St. Dimiana. I really liked the tiled murals in the courtyard on the walk up to the church. They used golden tiles that really caught the sunlight and made the artwork come to life. 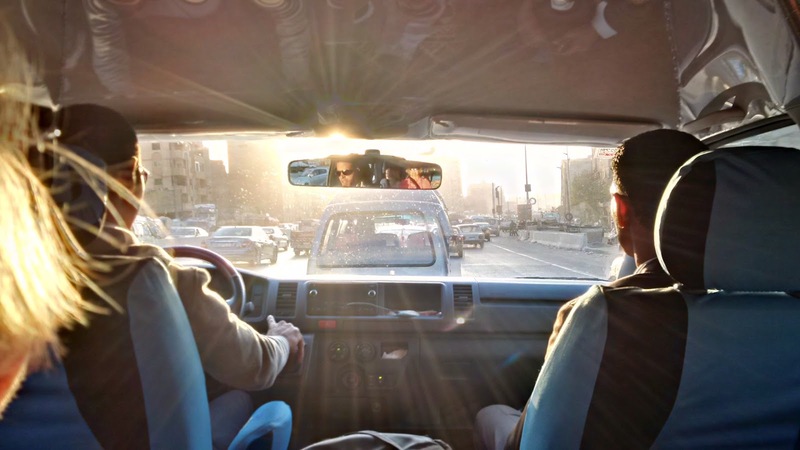 One of the interesting aspects of the Coptic church is the emphasis on the Holy Family in Egypt as described by Matthew (Chapter 2), who tells the story of how Joseph led his family into Egypt to escape the wrath of Herod. This photo does not do justice to the sun reflecting off the golden tiles. Inside the Hanging Church, there is a little map with all the things to see here. The exquisite craftsmanship is reflected everywhere, from the icons, to the barrel ceiling, to the carved stone walls. From the Hanging Church, we went around the corner to the Ben Ezra Synagogue. On the synagogue grounds, there is a well where the box that hid baby Moses is rumored to have been found. Or maybe the local legend is that the synagogue is said to be built on the exact place where Moses was found near the river shore. Whatever the legend, what is impressive is that the synagogue still exists in this part of the world. If only I could have positioned a minaret in the background. 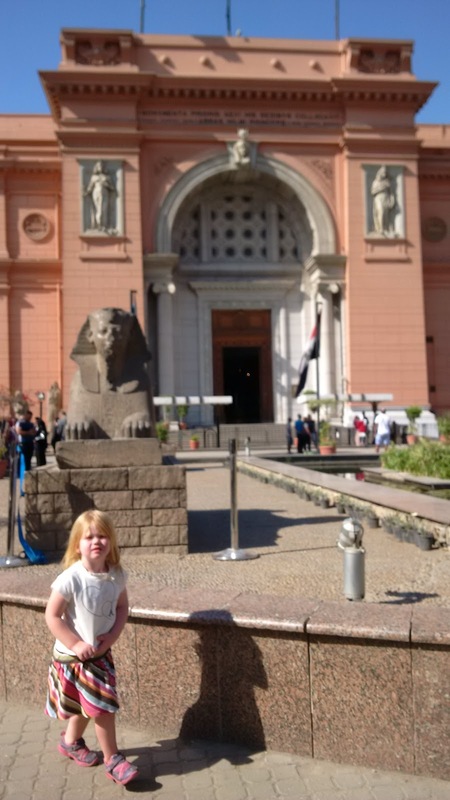 After the religious history tour, we headed over the the Egyptian Museum. 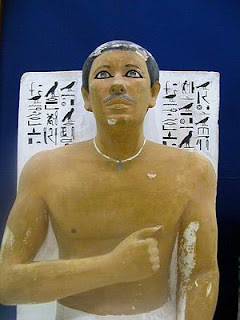 One set of statues (Rahotep and Nofret) was quite interesting because the guy had a mustache. That might not sound strange at first, but think about how many mustachioed guys you've seen in anything Egyptian you're ever seen. None, right? 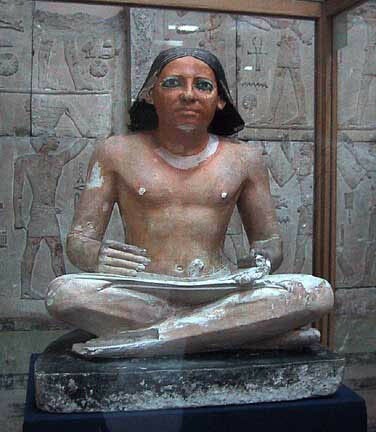 Another statue we saw was of Khafre Enthroned. It was larger than life, and had a falcon embracing his head. The statue is also on the Egyptian 10 pound note. In one corner (to the left of the main entrance), there is a shelf of carved stone fragments that our guide said was found near the Sphinx, and may be the nose of the Sphinx. If you didn't know, there is a lot of mystery surrounding the Sphinx, And while I think our guide was just joking, it isn't too hard to imagine the answer to the ancient mystery sitting on a shelf, gathering dust in a massive museum. The Sphinx is also on the Egyptian 100 pound note. Another "money shot" was of an ancient Egyptian scribe holding papyrus. 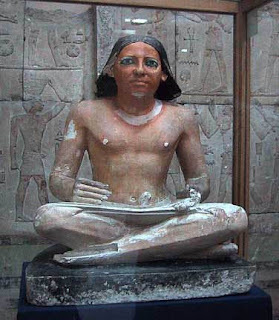 Culturally, it's interesting that there is also another, possibly more famous, Egyptian scribe called the "Seated Scribe" that resides in the Louvre Museum in Paris. But there are two significdifferences: 1) the Parisian scribe lacks the long hair, and 2) it's probably not on the Egyptian 200 pound note because it's a national treasure that is outside of the country. 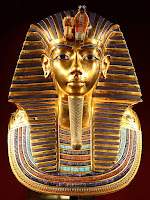 And no trip to the Egyptian Museum would be complete without visiting the King Tut exhibit. His burial chamber was found in the Valley of the Kings, which is one of our next tour stops in Luxor. 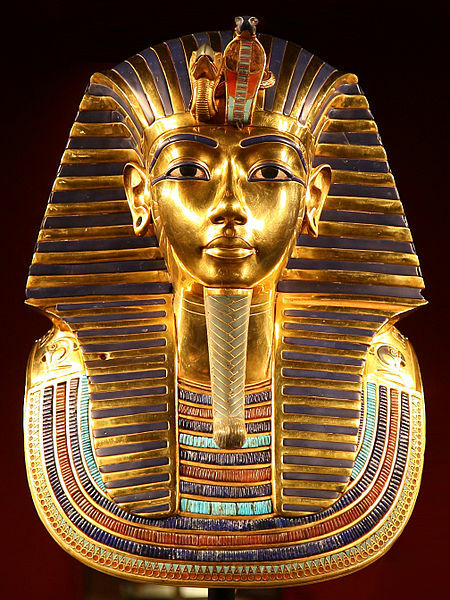 The mask weighs over 22 pounds (10kg), and is made from gold, lapis lazuli, obsidian, and several other stones. 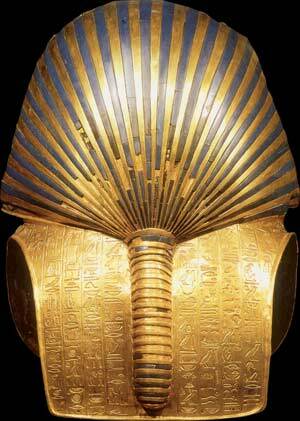 It was truly a work of art, and had hieroglyphics everywhere, even on the back of the mask.The Vulture (Nekhbet) and the Cobra (Wadjet) on the forehead is the royal insignia (the Uraeus) symbolising Tutankhamun's rule of both Upper and Lower Egypt, respectively. 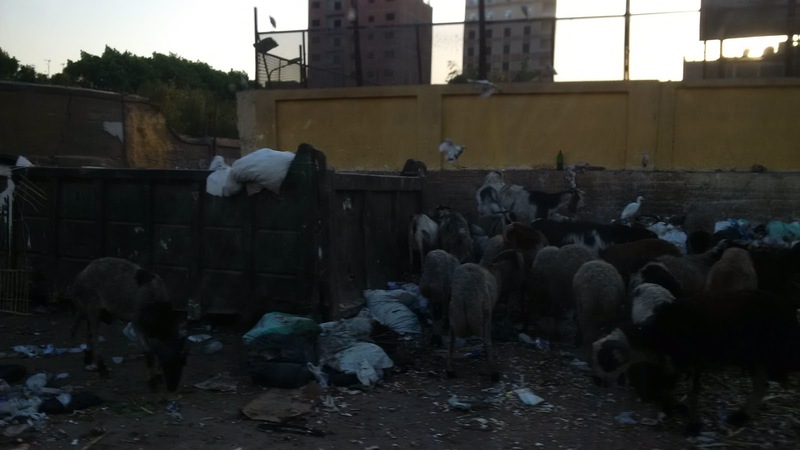 It's hard for us to think of Egypt as two countries way back when, but our cruise up the Nile really emphasized how different the two regions must have been. 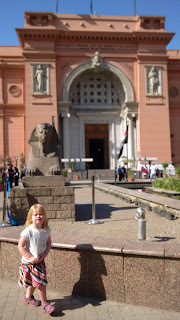 The Museum started to close while we were in the King Tut exhibit, so we were led outside. And of course, now our kids decided they really had to go to the bathroom. Fortunately, there was one on the museum grounds that was accessible from outside. Yes, the Egyptian Museum has bathrooms for when they need to GO. After the museum closed, we stopped into the Topaz Bazaar in El Haram. It was a jewelry store and we found some nice earrings. While we were browsing, Kacey's dad managed to catch the strap of his camera bag on a sculpture, which resulted in a shattering noise that sounded exactly like what you might imagine when a ceramic statue smashes into a stone floor. At first, we thought our girls had caused it. But they were looking aghast in Poppa's general direction, where he stood motionless and looking like the kid who broke the cookie jar. Now we had to buy the earrings. We saw a lot of fun things along the way back to the hotel: donkey carts, camels, sheep, overloaded trucks with eggs / plastic bags / palettes / mattresses / people holding on to improvised wooden structures that you wouldn't let you kids play on, much less ride on at 40 miles an hour. Local access road had very interesting vehicles. We made it back to the hotel in one piece, tired yet satisfied with all we'd seen today. 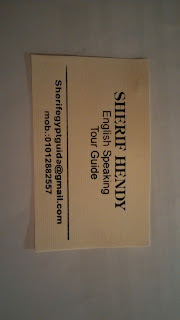 That was largely due to our English-speaking Tour Guide in Cairo, Sherif Hendy. 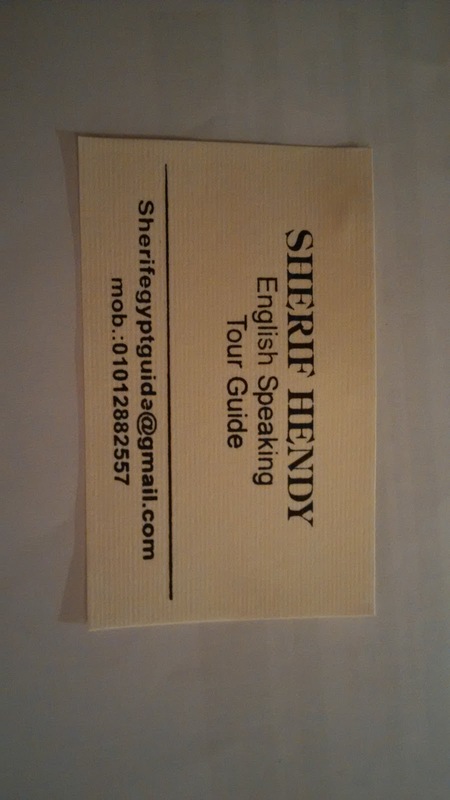 Here's his card, look him up. 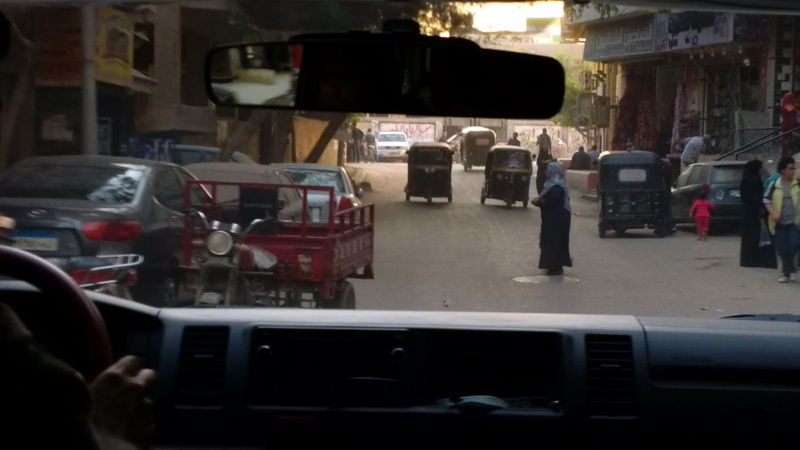 The next morning, we headed down to see the great temples in Luxor.